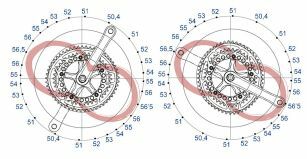 Integration of power measurement technology at the core of the crankset design means the INpower DM ROAD powermeter provides precise and comprehensive data to improve your pedalling performance. Power is measured in the left leg through two sets of opposing gauges in the axle delivering precise data metrics including power output, cadence, torque effectiveness and pedal smoothness. Powered via standard AA battery that lasts up to 300 hours, all electronics are housed inside the sealed water-proof axle for centered rotational weight & maximum device protection. INpower DM Road is a powerful tool for measuring your unique pedaling biomechanics via our ROTOR Power application. Access real time performance rich data including proprietary metrics TORQUE 360, Optimum Chainring Angle (OCA) and a recommendation of your Optimal Chainring Position (OCP). 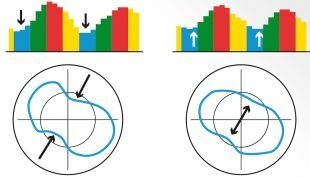 Combine this key information with Q RINGS oval chainrings to adjust your OCP in 1 of 5 different positions for fine-tuned pedalling efficiency and maximise transmission of power in your unique pedal rotation. Connect your INpower DM Road to your cycling device or smartphone via Bluetooth or ANT+ and easily export your data to deep dive into your training analysis with various platforms such as TraingingPeaks.com Direct Mount technology includes a clever spline interface between the crank arm and chainrings for superior stiffness and direct transfer of your pedalling torque.